1. 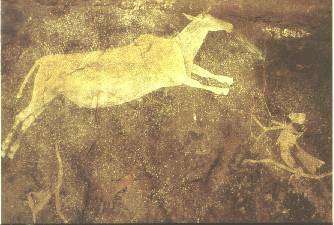 Rainmakers or shamans capture an animal painted in red ochre. Probably a rain ceremony. In San mythology, large herbivores are associated with rain. Drakensberg Mountains, KwaZulu-Natal, South Africa. 2. 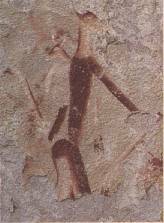 Rock painting from southern Africa of a hunter with bow and arrow and his prey. 3. 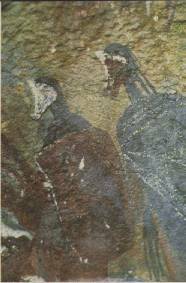 San rock painting from KwaZulu-Natal. Dancing women, some wearing traditional leather aprons and ostrich egg-shell knee bracelets. South Africa. 4. 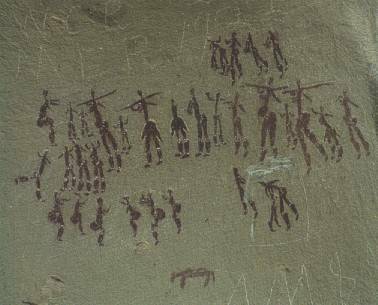 San rock painting of a band of hunters. KwaZulu-Natal, South Africa. 5. 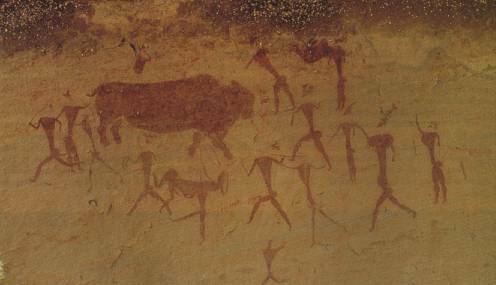 San rock painting from KwaZulu-Natal, South Africa. Figures wearing leather cloaks (karosses) have concave faces. 6. 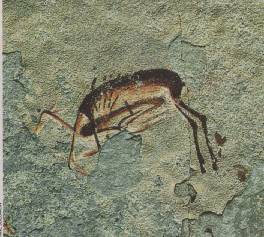 Rock painting from KwaZulu-Natal, South Africa. Antelope-human (therianthrope). In San mythology, after creation, the animal species differentiated themselves from humans. This figure may be carrying a smaller antelope on its back. 7. 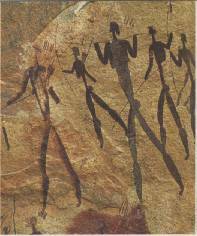 Rock painting from KwaZulu-Natal, South Africa. Two superimposed rheboks, the second with its head down. 8. 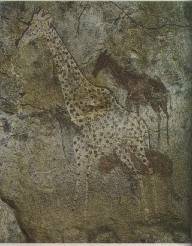 Rock painting from Zimbabwe, southern Africa. Giraffe. Humans and large herbivores possess an essential n!ow, which is a vital quality that can be good (good weather, birth) or bad (bad weather, death). 9. 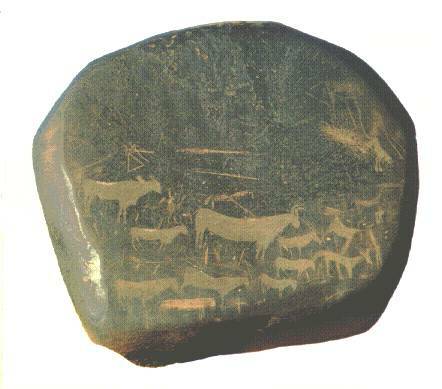 San rock engraving on a boulder from northern Cape Province, South Africa. Antelopes. The European couple toward upper left was added later.